There are a number of interesting things in the picture above. 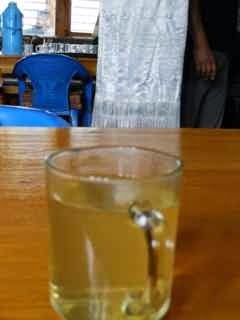 One, after each hike and sometimes even in the middle of the hike, we stop and the Sherpas serve us warm lemon team. It tastes like lemonade warmed up. It really hits the spot and both Aadam and I both like it. Second, the white scarf in the background is often given as a symbol of good luck and safe travels. While Nepal is primarily a Hindu state, in the mountains most people are Buddhist. These scarves are often blessed by local Lamas and then delivered. Finally, you can see the blue thermos and cups in which the Sherpa serve us our tea. Every evening when we come to dinner there is boiling water available. We fill our water bottles with this water. In our case we simply let it sit till morning at which time it is ready to be used for drinking and brushing our teeth. Other put the bottle in their bed overnight to keep them warm. We had visions of purifying the water using a steripen and also a filtration device. Our steripen is not working - new batteries I think are needed. Also our filtration devise is not necessary as it seems boiling is all that we need to do. In planning for this trip I envisioned using a dual purification system - filter and UV radiation. In reality though, it seems that boiling works just fine. We use this water for drinking, brushing, and even making soup for Aadam every morning. We are travelling with a large group. 3 already have diarrhea and 2 have a chest infection. We are using hand santizers frequently to try and prevent us catching the infection. For now we are both healthy. Enjoying your travel blog Aly. Quick question - you seem to be getting regular access to the internet. Is it readily available in the villages that you stay in each night after the day's trek? Haven't heard from you. Please call if you can.